↑ 2.0 2.1 2.2 2.3 "Robin Williams". James Lipton (host). Inside the Actors Studio. Bravo. June 10, 2001. No. 710, season 7. ↑ Thomas, Mike (February 24, 2002). "A nose for laughs". Chicago Sun-Times. http://nl.newsbank.com/nl-search/we/Archives?p_product=CSTB&p_theme=cstb&p_action=search&p_maxdocs=200&p_topdoc=1&p_text_direct-0=0F360C3C1592F9AE&p_field_direct-0=document_id&p_perpage=10&p_sort=YMD_date:D&s_trackval=GooglePM। আহৰণ কৰা হৈছে: December 14, 2009. ↑ McMullen, Marion (October 5, 2002). "Article: Weekend TV: Star profile. (Features)". Coventry Evening Telegraph. http://www.highbeam.com/doc/1G1-92577025.html। আহৰণ কৰা হৈছে: December 14, 2009. ↑ "Nevada Marriage Index". 1956-2005. http://www.ancestry.com/. ↑ Sources conflict. The print biographies The Life and Humor of Robin Williams: A Biography and Robin Williams: A Biography give his birth year as 1952. The Robin Williams Scrapbook also gives a birth year as 1952, as does Encyclopædia Britannica. Williams refers to himself as being "55" in an interview published July 4, 2007. Monk, Katherine (July 4, 2007). "Marriage 101 with Robin Williams". Canada.com. http://www.canada.com/saskatoonstarphoenix/news/lifestyle/news/lifestyle/story.html?id=8b777192-8e77-464d-b8da-0cb90be40901&k=1045. 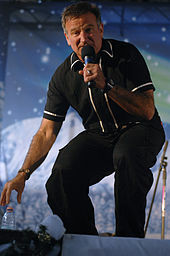 He also verifies his date of birth as July 21, 1951 in a fansite interview: Stuurman, Linda. RWF talks with Robin Williams: Proost!, May 25, 2008. ↑ Moore, Mary Ellen (January 1, 1979). Robin Williams. Grosset & Dunlap. ISBN 9780448171289. http://books.google.com/books?id=Vs_6tanL6T0C। আহৰণ কৰা হৈছে: August 12, 2014. ↑ "College of Marin Performing Arts – Drama Department". Marin.edu. http://www.marin.edu/performingarts/drama/। আহৰণ কৰা হৈছে: August 11, 2014. ↑ "Robin Williams Biography". Biography Channel. http://www.thebiographychannel.co.uk/biographies/robin-williams.html। আহৰণ কৰা হৈছে: September 27, 2012. ↑ "Mork & Mindy". http://www.retrojunk.com/article/show/2981/mork-mindy। আহৰণ কৰা হৈছে: August 12, 2014. ↑ Monk, Katherine (12 August 2014). "A clown and his demons: Robin Williams mixed zany comedy, sharp satire and pathos". vancouversun.com. http://www.vancouversun.com/entertainment/movie-guide/clown+demons+Robin+Williams+mixed+zany+comedy+sharp+satire+pathos/10110121/story.html। আহৰণ কৰা হৈছে: August 12, 2014. ↑ Brennan, Sandra. "Robin Williams". http://www.allmovie.com/artist/robin-williams-p116900। আহৰণ কৰা হৈছে: August 12, 2014. ↑ Deming, Mark. "One Hour Photo (2002)". http://www.allmovie.com/movie/one-hour-photo-v260306। আহৰণ কৰা হৈছে: August 12, 2014. ↑ "Robin Williams revealed favourite memories and games on Reddit forum". ABC News (Australia). http://www.abc.net.au/news/2014-08-12/robin-williams-ask-me-anything/5664570। আহৰণ কৰা হৈছে: August 12, 2014. ↑ Hoffman, Jan (August 9, 1992). "The Sexes; Pillow Talk". The New York Times. http://www.nytimes.com/1992/08/09/style/the-sexes-pillow-talk.html। আহৰণ কৰা হৈছে: December 26, 2007. ↑ 18.0 18.1 Hochman, David (September 9, 2 013). "Still Crazy: Years after Mork and Buffy, Robin Williams and Sarah Michelle Gellar hope to rope us in with a new sitcom". TV Guide. pp. 16–19. ↑ Ravitz, Justin (October 24, 2011). "Robin Williams Weds!". US Weekly. 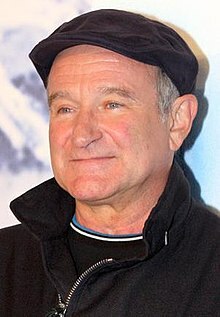 http://www.usmagazine.com/celebritynews/news/robin-williams-weds-20112410. ↑ Itzkoff, Dave; Fitzsimmons, Emma G. (August 11, 2014). "Robin Williams, Oscar-Winning Comedian, Dies at 63". New York Times. http://www.nytimes.com/2014/08/12/movies/robin-williams-oscar-winning-comedian-dies-at-63.html। আহৰণ কৰা হৈছে: August 11, 2014. ↑ "Robin Williams Dies of Suspected Suicide". The Hollywood Reporter. August 11, 2014. http://www.hollywoodreporter.com/news/robin-williams-dies-suspected-suicide-724724। আহৰণ কৰা হৈছে: August 11, 2014. ↑ "Robin Williams Found Dead in Possible Suicide". Variety (magazine). August 11, 2014. http://variety.com/2014/film/news/robin-williams-found-dead-in-possible-suicide-1201280386/। আহৰণ কৰা হৈছে: August 11, 2014. ↑ "Robin Williams dead". Denver. Channel. August 11, 2014. http://www.thedenverchannel.com/entertainment/actor-robin-williams-found-dead। আহৰণ কৰা হৈছে: August 11, 2014. ↑ Sperling, Nicole. "Robin Williams dead at 63". Entertainment Weekly Inc. http://insidemovies.ew.com/2014/08/11/robin-williams-dead-at-63/। আহৰণ কৰা হৈছে: August 11, 2014. Jay David (1999). The Life and Humor of Robin Williams: A Biography. প্ৰকাশক New York: Quill. ISBN 978-0-688-15245-1. Stephen J. Spignesi (1997). The Robin Williams Scrapbook. প্ৰকাশক Secaucus, NJ: Carol Pub.. ISBN 978-0-8065-1891-6. Robin Williams at the "Internet Broadway Database"